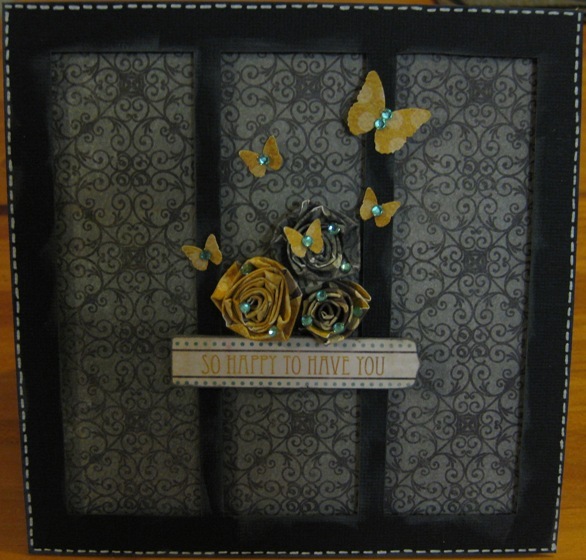 Rather than layering the rectangles on top of the backing, I cut out a black frame with 3 rectangluar holes. I used foam tape to raise up the black frame from the grey pattern background sheet. I made some gorgeous little roses (see the tutorial by the beautiful Belle here) and punched out some little butterflies with my Martha Stewart punch. A liberal sprinking of bling was obviously obligatory!!! And the little sentiment is a sticker that I backed with card, trimmed and mounted on the black frame with some more foam tape. 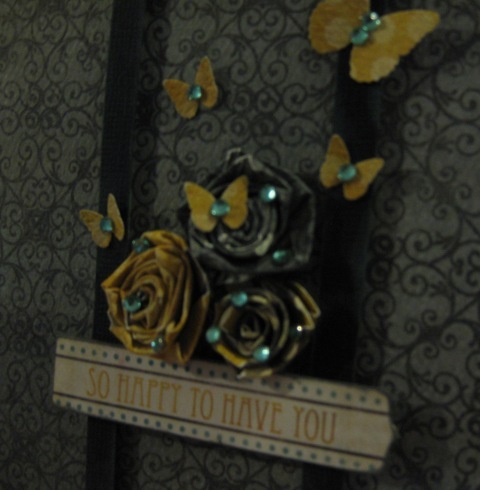 All the paper and the sentiment sticker are from the Stella and Rose range from My Mind’s Eye. Really like this little card and can see myself using this sketch regularly. Thanks for the challenge Card and a Half…really enjoyed it!